Objectives: Growth and development of preterm infants may be negatively affected by constant bright light in neonatal intensive care units ( NICUs ). It may also contribute to sleep pattern disorders commonly seen in in this group of infants. Reducing exposure to light by covering the incubators is recommended by guidelines of the Neonatal Individualized Developmental Care and Assessment Program (NIDCAP). 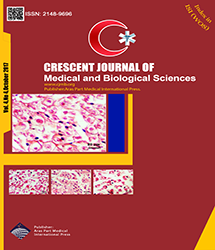 Materials and Methods: This randomized clinical trial study was performed on 60 preterm infants with gestational age of 28-32 weeks admitted at NICU of Al-Zahra Teaching Hospital of Tabriz University of Medical Sciences in 2014. Preterm infants were divided randomly in 2 groups: In the first group (intervention), incubators were covered with a thick cover and the face was covered with a cloth (face cover). In the second group (observation), incubators were covered with a thick cover but the face was not covered. We darkened the environment of NICU by closing the curtain and turning off additional florescent lights from 19:30 pm till 7:30 am in both groups, then we compared sleep pattern in 2 groups of infants by using sleep diagram. Results: In the intervention group (face cover), the mean frequency of sleep during the 6 days increased by 2.96 times/observations and the mean amount of sleep increased by 59 minutes. Conclusion: This study showed that light reduction with incubator covers and eye shield, increases the frequency and sleep duration in premature infants.